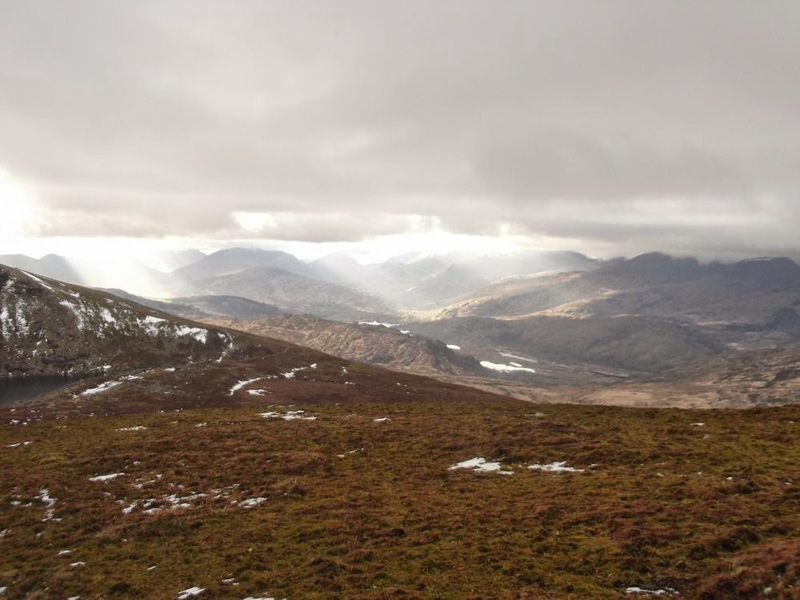 We may be running an extra Mountain Skills 1 in Kerry on 14th & 15th Feb. 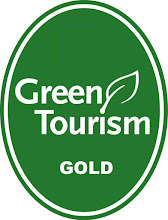 If you are interested please contact Nathan on +353 (0) 86 860 45 63 or info@outdoorsireland.com. 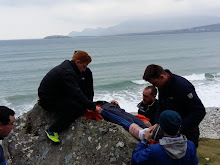 First Aid Level 3 is the requirement for outdoor instructors and guides and this course is valid for three years. However we repeat our First Aid Level 3 each year, in the spring. The scheme we complete is Remote Emergency Care Level 3. Marie Lyons from Remote West First Aid runs our training and she is excellent! Her website is www.remotewestfirstaid.com. I highly recommend her if you are looking for a first aid course; especially if you are progressing through the Mountain Skills, Rock Climb Skills or Kayak Skills awards. We ran a non-snow dependant Winter Mountaineering Course in the MacGillycuddy Reeks a couple of weeks ago. Here are some photos from the day. ''Alan Wallace with Kerry Mountain Rescue says they’ve noticed almost half of their rescues are used to locate people who are lost. Grieving wreckage of a once proud boat. Where are the storm wrecked sailors? And the precious cargo they fought so hard to hold? But the grand scheme lost in the lives of the ten. Sleep precious cargo and wasted sailor. and the open wild of Galway Bay. 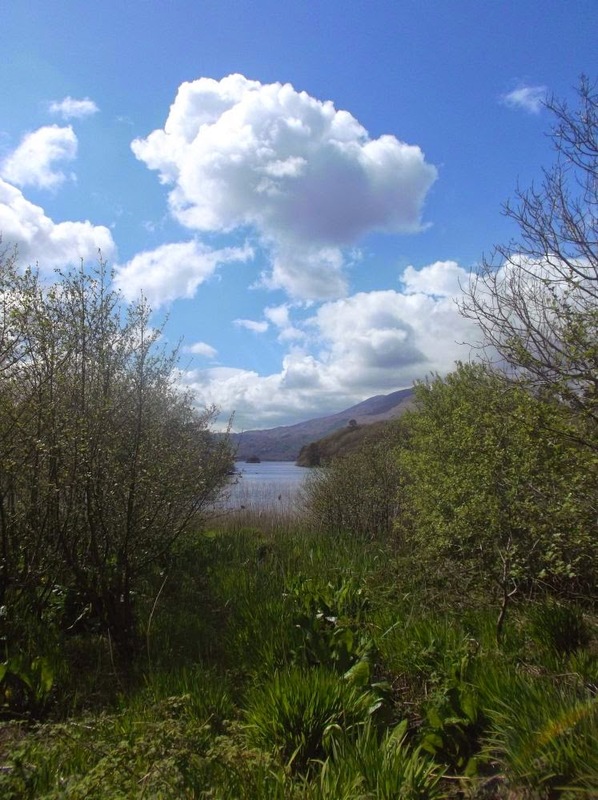 Guided Hike Through Killarney National Park; Along The Lakes Of Killarney, Skirting The Side Of Torc Mountain, Past The Impressive Torc Waterfall, Through Muckross House & Gardens & Into The Ruins Of Muckross Abbey. 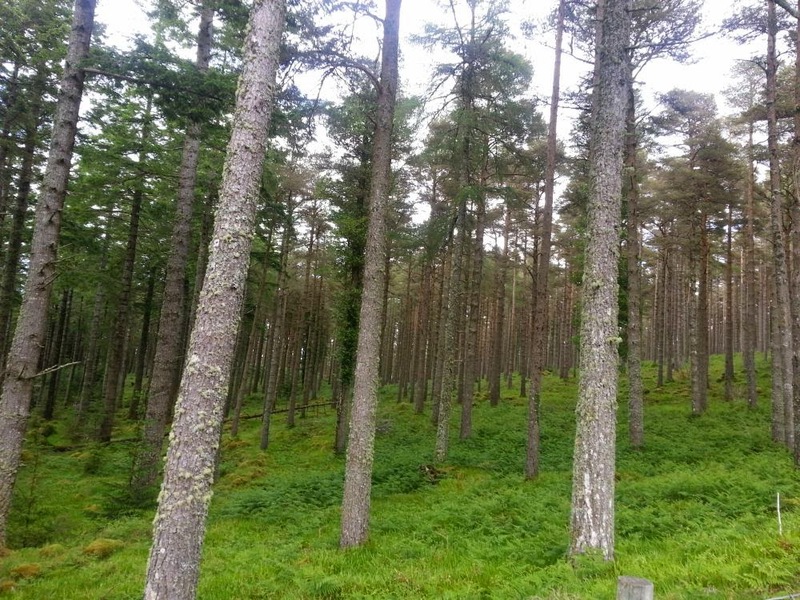 Hike Through The Oak Woods Of Killarney National Park. Coffee & Scones At The Luxurious Muckross Park Hotel. Then Follow An Ancient Coach Road & Famine Road Through The Valley Passes To The Beautiful Town Of Kenmare. Follow A High Green Road & Part Of The Kerry Way, Past Ruined Famine Cottages & Turf Cuttings, Along Rolling Heather Slopes & Through Thick Pine Woods. 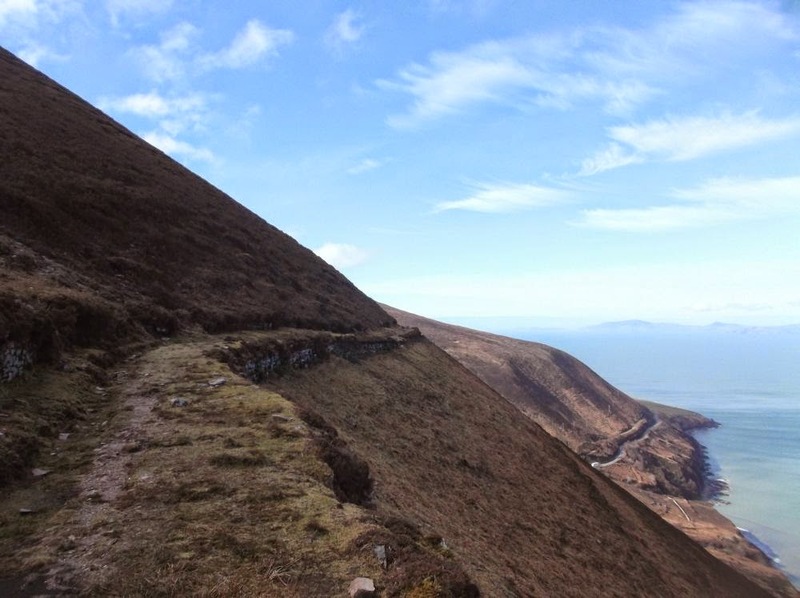 Savour Spectacular Views Straight Down Over Dingle Bay, Inch Beach & The Blasket Islands. Finish With Coffee & Scones At The Towers Hotel, In The Victorian Village Of Glenbeigh. Rounded Lamb's Head in friendly sea conditions; then hoisted an excellent kayak sail, and headed north west downwind, for an open bay crossing directly to Bolus Head. Hog's Head was on my right, a couple of km away, with the old 1920s barracks standing stark on the rugged skyline. A dolphin flashed by off my bow heading towards Ballinskelligs Bay. An hour and a half of downwind paddling and kayak sailing took me to Bolus Head, and although I kept the sail up, the gentle sea conditions stepped up a level here as bouncy swell ricocheted back off the grim headland, unsure which direction it should flow. The second part of Bolus Head is Ducalla Head and I rounded this as darkness fell at about 6pm, after a lingering orange grey sunset. Clearing Ducalla Head I entered the sheltered calm of Finian's Bay. Wind died, oily gentle rolling waters and an incoming tide took me into the bay. It was too dark to risk looking for a camping spot on my right side cliffs; part of Bolus Head. Although Puffin Island was directly in front of me, a couple of hours away, and on my route for tomorrow it was too dark to mess around in the surging waters of an island I didn't know looking for a kayak landing spot. House lights and Christmas lights of dwellings stacked on the sides of Finian's Bay led me, like multiple lighthouses, to shelter. I was looking for a beautiful, old and extensive fishing pier and quay marked on my OS map, and a spot I knew from swimming in the past. Fifteen mins of half enjoyment and half annoyance as I explored the many tiny rocky inlets for the quay, many of them ending in echoing overhangs and caves. Two orange street lamps on the pier gave it away and phosperessance in the water flashed over my paddle blades. As a challenge I had somewhat hoped for it to be colder December weather, as it somewhat focuses your survival actions. It was reasonably warm, however I was still concious of working fast as I unpacked my kayak of tent, stove, food and most importantly - warm dry layers for the night and then the next day's paddle. Comfortable night on the pier, slept the best in a long time. Traveled just over 30km that day. Two hours the next morning to cook baked beans, drink a pan of coffee, pack the kayak and change back into my damp kayaking gear. I was on the water for 830am to witness a spectacular red and yellow dawn with the rising sun over Bolus Head. Dancing rays of sunlight dazzled me as I fought slowly against the wind and lumpy churning swell for the first hour. This was reasonably serious and focused kayaking, so not much time to enjoy the sunrise and certainly no time to take any photos. Tide, wind, swell, waves, cliffs all fighting, churning, booming and swirling as I slowly headed towards Puffin Island. Puffin Sound, a narrow channel between Puffin Island and the mainland, was my route to safety and this protruded with black toothy rocks and smashing waves. Slightly apprehensively I paused in the swell for a break in the sets of waves surfing through Puffin Sound. When the break came I paddled hard and fast, having to part surf through the rocks on either side. Like a switch had been flicked, the rocks blocking Puffin Sound blocked the force of the sea and although waves and wind roared just 20m behind me I sat and relaxed in my kayak for the first time that morning. The wind was a force four, pushing force five, and with no swell or waves to speak of now I raised my kayak sail and took off downwind, skirting high black cliffs and pinnacles, like the ancient defences of a sprawling fortress. The wind was powerful enough that I was rocketing along doing approx 7km per hour just with my kayak sail, only using my paddle for steering and the occasional bracing stroke. Amazing feeling to be properly sailing in a kayak, moving faster than if I had been paddling normally! As I approached the entrance to Portmagee Channel the wind freshened even more and waves rolled in off the Skellig Islands far out on my left. I debated dropping the sail but the speed was too awesome and the actual act of stopping moving to pack up the sail would perhaps put me at more risk of capsising than if I continued as I was, I just hoped for no more wind or waves. Narrow channels led me between several island, past the tracings of 5th/6th century monastic ruins. 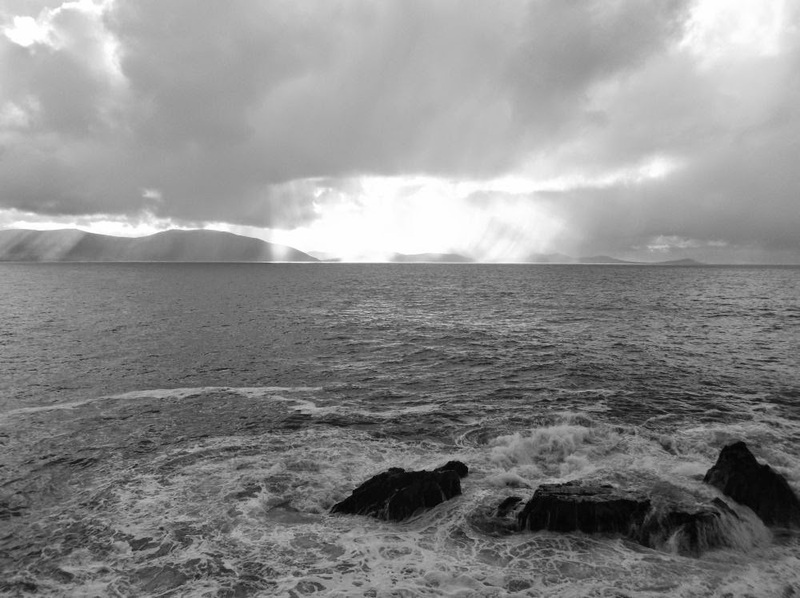 Suddenly the wind vanished, the water flattened and I was in Portmagee Channel, just as the tide began to ebb. Ten mins of paddling against the tide landed me among the colorful fishing boats at Portmagee. Just over 10km this morning in just over two hours. Buoyancy aid, flares and helmet dropped into the kayak. Into the blazing turf fire of The Bridge Bar in my kayaking gear and wellies to enjoy several delicious hot whiskeys. Then upstairs to one of their amazing sea-view bedroooms for a long hot jacuzzi bath. There wasn't major hardship in this overnight sea kayak trip, but for me one of the best things about being out in the wilderness is the enjoyment of a fire, bath, thick carpet and good food on return to civilisation. Meanwhile as I return to work this week I can still hear the comforting cry of gulls overhead and I can still feel the adrenaline of surfing to safety through Puffin Sound.